Butterflies are the flying gems of the garden and populations are at their peak this time of year. Although they look fragile some butterflies, driven by instinct, migrate thousands of miles, while others live their entire lives locally. With a little planning you can create a wildlife garden habitat that attracts, feeds and harbors a wide variety of butterflies. To attract butterflies, incorporate plants in your garden that cater to their year round needs at all stages of their lifecycle. Adult butterflies feed primarily on nectar, and larvae (caterpillars) feed on leaves, some flowers and seeds. They also need places to lay eggs and to pupate. Butterflies have co-evolved with plants and each butterfly species requires specific plants to carry-out their life stages. The best known example is the monarch butterfly, it will only lay its eggs on milkweeds, which then serve as a food source for their caterpillars. Swallowtails like parsley, fennel and dill plants; Sulfers prefer clover, peas, vetch and asters, and Fritillary feed on buckeye and snapdragons. Adult butterflies are in constant search of nectar. They are attracted by fragrance and color, especially purple, orange, red and yellow flowers. Butterflies feed on a wide range of trees, shrubs, annual and perennial plants. Some examples of nectar-producing annual plants that are attractive to adult butterflies include: Ageratum, Angelonia, Bidens, Cosmos, Dianthus, Heliotrope, Lantana, Marigold, Petunia, Snapdragon, Verbena and Zinnia. Perennials plants attractive to adult butterflies are many and varied, here are a few of the most common: Achillea, Ajuga, Aster, Buddleia, Coreopsis, Echinacea, Heuchera, Liatris, Monarda, Rudbeckia, Sedum and Solidago. As an added benefit, many of the plants that attract butterflies, also bring hummingbirds. In addition to providing food sources for adult- and larval-stage butterflies it’s important that you create a nurturing habitat. 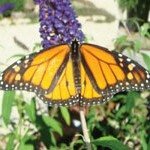 Your butterfly garden should be in a sunny, sheltered location, near a windbreak such as a vine-covered trellis, a fence or hedge. Hedges provide safe places for butterflies to roost at night. Cold-blooded butterflies like to bask in the sun, so placing large, dark stones in your garden to give butterflies a warming perch. Butterflies also need water. Provide them with a shallow dish with pebbles in it, or a damp sandy area. Don’t use pesticides in your garden as most are toxic to butterflies in all their life cycle stages. For a more comprehensive list of plants for butterflies visit The Growing Place and ask for our brochure, “Bees, Birds, Butterflies and Bats in Your Garden” and a copy of the Chicagoland Gardening Magazine reprint of their article on butterflies.